Astrologers practicing Parashari method have two main tools for ‘Timing an Event’, namely, Dasha & Bhukti and Transit predictions. The irony is that Dasha & Bhukti can be used independently, whereas Transit has to be read in conjunction with Dasha & Bhukti. To be precise, the result obtained by Transit has to be supported by the results of Dasha & Bhukti otherwise Transit results may not happen. Latta is a part of Transit predictions and as such it has to be read in conjunction with the prevailing Dasha & Bhukti of the native. This word Latta means ‘Kick’ or Obstruction. During transit, a planet transiting a particular Nakshatra will afflict another Nakshatra at a distance. If the afflicted Nakshatra happens to be your Janma Nakshatra, you are said to be under the influence of Latta of that particular planet. This distance is measured either forward or backward from that particular Nakshatra. The forward measurement is called “Purolatta” or Forward kick and backward measurement is called “Prustolatta” or Backward kick. If Sun occupies, at any time Moola Nakshatra, his Latta Nakshatra will be Krittika which 12th from Moola counting forward. The general effect of Latta is bad. If the Natal star comes under the Latta effects of two or more planets, bad effects will be greatly enhanced. Sun’s Latta causes loss of entire effects of the native, trouble from Government and trouble for father. Mars Latta causes utter ruination and trouble from co-borns. Mercury causes fall and disaster. Venus causes trouble to spouse. Jupiter causes death, ruin of relatives and insecurity. Saturn same as that of Sun, trouble from elder brother and body discomfort. Rahu causes trouble to grandfather and misery. Ketu cause trouble from reptiles, exile and misery. Generally Latta is considered bad and by taking remedial measures individual can get relief. Some Panchangas in South India (eg. Ontikoppal Panchangam) gives the dates of Latta of all planets during that year which affects different Janma Nakshatras. By knowing your Latta periods before hand you can be prepared to counter it. It is again the time of the annual transit of Jupiter and the analysis of its results for 12 Rashis. Jupiter will transit from Aries to Taurus on 17th May 2012 and it will remain in Taurus for about a year, till 31st May 2013 to be precise. In Vedic Astrology, Jupiter is regarded as the most auspicious planet among all the 9 planets, because of its abilities to bestow all that is good for a generous and respectful life. Jupiter is Guru or Teacher of Devatas and been conferred the title of “Devaguru”. He is the most auspicious and benefic planet. However, this does not imply or mean that He does not do any harm or damage. When Jupiter is malefic, it gives nothing but fear and tears. It ruins the reputation, destroys wealth and brings disaster in life. Jupiter takes about 12 years to complete cycle of 12 zodiac signs. It stays for about a year in each sign. Whenever Jupiter moves in to 2nd, 5th, 7th, 9th and 11th houses from the Janmarashi it gives good results. We can say that the native has Gurubala. Jupiter rules Sagittarius and Pisces where it embodies all the planet’s positive aspects, and is exalted in Cancer where it expands the nurturing and mothering principle. Jupiter is debilitated in Capricorn and gives least results when posited there. Jupiter is the significator for wealth, children, education, religion, prosperity, fame, gain, good marital order, providential help, political power, good luck, finances and long journeys. As regards health, Jupiter rules: blood, liver, arteries, thighs, neck, weight problems, diabetes, cataract, intoxication, biliousness, cholesterol. Aries – Jupiter in 2nd House. Best place to have for wealth & finances. You will be able to improve your finances and make gains. Gains will also be there through profession, father, foreign countries, and change of place and long travels. There will be harmony among married couples and children will see an improvement in their well being. Your reputation in the society will increase and you can even expect to be honored by government. Opportunity for pilgrimages is likely. Health will show improvement. Taurus – Jupiter in 1st House. Expenses will be there through children, control your spending. Desires may take longer time before they get realized. Separation from family and disappointment with spouse is likely. Friends will take advantage of you. Do not get involved in unnecessary talks. You may have to wait longer for long distance or foreign journeys. Inheritance issues may create differences among siblings. Health needs to be taken care of. Expenses will be high. Wasteful expenditures will be there for travelling. Some unfruitful traveling or wanderings is likely. Investment matters need careful handling. You may stay away from your home country or family. People in high rank will be prone to face defamation. Those in partnership business may face losses. Friends will be a cause of concern. Stay away from addictions. Spouse will be prone to ailment. Forceful transfer for some is on the cards. You will be purchasing properties and ornaments. Gains will be there through communication and siblings. Your reputation will improve and you will be honored in career. Your friends circle will increase and you will get involved in new hobbies. Your pleasures will increase. Frequent short trips are on the cards. Those in partnership business, commission and liaison will do well. You will learn new skills and your confidence level will increase. A short journey to pilgrimage is likely. You may visit a family deity temple and/or holy place to fulfill your vows. Impediments /Change in job or career. People associated with Government Service need to pay more attention to job. Generally struggles in career and delay in return of money lent. Away from home country or family due to profession. Litigation or expenses from legal issues may be expected during this year. You will participate in auspicious gatherings and do charity / philanthropic deeds. Health wise you may experience problems in the back bone. You would not be able to accumulate money. Be wary of ill fame in profession. There will be harmony among married couples. Financial status will improve. Fortunes will increase. Transfer, promotion or transfer with promotion is on the cards. Gains will be there through father, higher education, foreign connection and repayment of debts. Health will be good and those suffering from illness will see an improvement. You will be spiritual and participate in religious activities. Blessings from spiritual people and elders will be there. A long journey to pilgrimage is likely. Expenses will be there for auspicious events. There will be some unexpected gains through unauthorized source. You may have to stay in foreign land. Long-pending financial issues will get resolved. You may face difficulty taking decisions. Hasty decisions will prove costly. Disputes will be there in paternal property. There will be fear of death and disease. Be wary of laziness, insults, mean friendships, defeats and quick temper. Digestive problems and blood related diseases may affect your health. Be careful against bad company. Journeys will not be favorable. You will be prone to accidents. There will be problems in the family and you may get reclusive feeling. Auspicious ceremonies are expected including marriages. Benefits will be there through business and life partner. You will enjoy a good health. Pleasure trips will be enjoyed and you will spend quality time with your family. Love affairs will be fruitful and marital couples will enjoy a good time. You may go on a pilgrimage and meet saints through partner or friends. Overseas travels are on the card. Litigation issues will come to an end and you will be able to win over your enemies. You may reside in a foreign land. Health problems will be there for your parents. A separation from near relation is indicated. There can be a change in your career and professional life will be struggling. Efforts will not give you immediate result and satisfaction. Expenses will be possible by paying fines and penalties. There will be delay in receiving monetary help. Be careful while driving as you are prone to accidents. There will be disharmony among married couples. Loss in property and feeling of loneliness will be there. Problems through government will be there. Birth of a child and financial gains will be on the cards. Married couples will enjoy peace and harmony. You may have plans to visit a pilgrim center and take the blessings of a spiritual master. There will be prospects for a new career. You may get promotion with transfer and relocation will be good for you. Interviews will be successful. Love affairs will be favorable. Those aspiring for higher education in foreign land will get opportunity. Gains will be there through siblings and ancestral property. Your popularity among siblings will increase Expenses will be there for religious activities. You may enjoy divine experiences. Adoption and other humanitarian gestures will come to fore. Gains will be possible through mother, property or vehicle. Those having desires to going for long travel will have their wish fulfilled. You may even get a job abroad. A new member may join the family. There will be association with influential people. Your comforts will increase; buying a new car is likely. Sudden gains are on the cards. You will be spiritually inclined. Health issues may trouble mother. Be cautious against bad investments. Your thinking will be aggressive and you will be prone to tensions and sorrows. Have extra caution with relatives, disputes are likely. Travels will not be favorable and you may suffer from discomfort. Electronic devises will bring expenses. Carelessness in profession will be possible and there may be issues with memorizing things. Some problem may come up with your assets. I have been flooded with request to write about the art of transit interpretation as people are not satisfied with general results which are given for each Rashi. I might warn the readers that interpretation of transit results is not that easy and it is a intricate / complex process involving several factors. Therefore I am giving the methodology of the process of reading the results taking one sample case and the readers are advised to adopt / modify the same for their specific chart. Workout the following to assess the goodness / evil nature and potency of Jupiter in your individual charts, by going through the following steps. 2. There are 12 ascendants and therefore Jupiter will have Lordship of two of the houses out of the twelve. 3. Out of the two lordships, both can be good / one bad & one good. Jupiter, wherever he is posited in dual houses will favour that house. For e.g. Jupiter for Leo Lagna will be 5th & 8th Lord and posited in Sagittarius will favour 5th house and accordingly give more results of 5th house. 4. Then we have to see Jupiter’s placement in the chart, viz. placed in Own House / Friend’s House /Enemy House / Exalted / Debilitated / retrograde. 6. Yogas formed by Jupiter. 7. Strength / Shadbala of Jupiter. 9. Note down the Dasha / Bhukti running for you during the transit. 1. Reference Point: The reference or starting point for Transit prediction is the Janmarashi or the sign in which the Moon is posited in the natal chart. There are many astrologers who advocate interpretation with reference to Lagna or Ascendant but the classical texts recommend using Janmarashi only. 2. Dasha and Bhukti: Whatever interpretation we arrive at using above method must be supported by the Dasha and Bhukti currently running for the native. If the Dasha and Bhukti is not favourable then the results thus predicted may not come true. 1. Lagna –Scorpio. Jupiter is Lord of 2nd & 5th Houses. Both houses are good. 4. Shadbala of Jupiter is the least, 74 amongst all the planets. 5. In present transit the native will have Jupiter in 2nd house basically indicating acquisition of wealth. This also indicates improvement in health and cordial relationship with near and dear ones. This also indicates that good things will happen to his kith and kin and his children. 6. Wealth from where, how and from whom and how much? 7. Jupiter being 2nd & 5th Lord, it will be self earned and /or from his issues. Basically it will be from the Karakatwas of those houses. 8. Jupiter posited in 3rd house also indicate that wealth can be from co-born or through courage and communication. Jupiter’s association with Saturn also indicates the wealth may be from Service. 9. The quantum will not be much because Jupiter is debilitated and has no strength. 10. The acquisition will also be erratic since he is retrograde. This will be compounded when transit Jupiter turns retrograde. 11. The result is also dependent on Saturn transit position which at the moment (6th form Natal Moon) is favourable. But when Saturn shifts to Libra on 04 Aug 2012, he will become unfavourable. 12. When Jupiter is in 2nd house Veda point in 12th. However no planet is posited there and hence there is no Veda. If there is Veda, his benefic character will be further reduced. 13. Native has started his Jupiter Mahadasha on 26 Jan 2012 and will have Jupiter Bhukti till March 2014 and therefore whatever Transit results are arrived at is being supported by Dasha & Bhukti. 14. We can reasonably conclude that Transit predictions will hold good. People for whom Jupiter is in unfavourable position need not despair. Jupiter being the most benefic planet will normally not harm any native unless he is highly afflicted. As stated earlier Jupiter is the promoter par excellence, and we wish that all mankind receive his blessings for peace and harmony. Propitiating Lord Shiva on Mondays and Thursdays and reciting following Mantras will mitigate difficulties. Everyone in astrology knows that Saturn is the single most powerful planet. He can make or mar a person. Once a king by the name ‘Nala’ lost his kingdom and was reduced to a cook because of the devastating influence of Saturn. Saturn does not even spare Gods. It is said that during Saturn’s time Ganesha’s human head was cut off by Shiva. Shiva himself started to beg during Saturn’s period. Nevertheless, he appointed Saturn to do a certain job and that is to bring people to justice (Dharma) through intense hardship and suffering. Shiva Himself underwent the humiliation of a beggar just to teach a lesson to the human beings and also to demonstrate the power of Saturn. Saturn’s transit is a major astrological event and it is keenly watched and analysed by astrologers all over the world. This year Saturn moves into Libra on 15th November 2011 and this event has special connotation for two important reasons. He moves to his exaltation sign and his best friend’s house (Athi Mithra). Therefore his power to do good / bad is that much enhanced. With this transit, Saturn moves to the 6th house for the sign of Taurus. Saturn is benefic to your sign. This transit will not cause problems for you except for the possibility of a small disappointment but this may also bring some unexpected good luck. You will overcome enemies and diseases and a strong and exalted Saturn will boost your will power and physical capacity. You may also experience some interpersonal irritations, but do not worry about it. Academic success for students may be expected during this transit. When Saturn enters Libra, the 5th house your circumstances should improve, even though the 5th house is not a favorable position for Saturn. However, you will receive more benefits than you would normally accrue. During this period of Saturn Transit, you may face some obstacles related to marriage of a son or daughter and you may need to take more care in relation to your children’s health. Any speculative business you are involved in will initially suffer but then will improve. Now Saturn transits to Libra, the 4th house, which generally is not a good placement. 4th house indicates confusions and creates more ambiguity. You will have difficulty making prompt decisions. In this period, great gains are not predicted. You could experience a loss of status and diminished reputation during this period. Keep this in mind and try to mitigate any possibility for unwarranted assaults on your name. Academic progress for students will be unremarkable. You will have relief from difficulties when Saturn enters Libra, the 3rd house of your sign. You may soon enjoy prosperity. You are likely to travel abroad during this period of Saturn Transit. You will benefit much from communication related endeavors. The journeys that you undertake will bring profits. Those who work in literary and media fields will experience improvement and advancement in their work during this period of Saturn Transit. You are entering the last phase of Saturn’s ‘Sade Sathi’. Saturn is transiting to Libra, your 2nd house. 2nd house is not favorable but there will be some unexpected gains during this period. The gains are expected through a life partner and/or a business partner. Marriage plans should be avoided during this time. Students who practice sports will excel during this period of Saturn Transit. You are currently under the influence of the seven and a half year Saturn period. In this transit, he occupies your own sign which is his exalted. This is period where you have to more careful with your health and finances. There will be ups and downs, so make investments carefully. You can expect a good relationship with your life partner, if you act sensibly during this period. You will gain power in order to tackle issues effectively as they arise during this period. Saturn’s transit to Libra, the 12th house starts your journey through the 7-1/2 years of Saturn period (“Sade Sati”). You need not panic about the next 7-1/2 years of Saturn. Finances will be tight. Medical expenses are also indicated during this time. Receiving guests and paying for expenses related to events and hospitality will be more likely during this period of Saturn Transit. There may be some obstacles in ventures regarding profession during this period. Until this transit you were experiencing official and professional troubles due to Saturn’s transit through Virgo, the 10th house. Now it is time for you to relax. Saturn will be transiting Libra, the 11th house from your Moon sign. Generally, the 11th house is the house of profit. Saturn has to ensure your good health during this period. Children will bring happiness. Their attempts to gain advantageous employment will be fruitful. Your ventures will bring success during this period. To predict transit results of planets traversing different Nakshatra vis-à-vis Janma Nakshatra. Draw seven horizontal lines from West to East and seven vertical lines from North to South as shown in the diagram below. 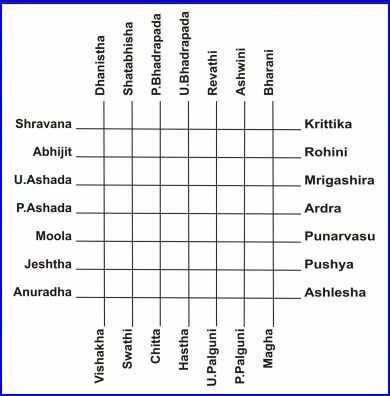 Nakshatra opposite to each other causes Nakshatra Veda. For example, Krittika causes Veda to Shravana and vice versa. The Vedha star to the Janma Nakshatra, there will be apprehension of danger to life. The Kharmaksha (10th from the Janma Nakshatra), loss of wealth will take place. If the Sun in the above position be also associated with a malefic, death alone has to be expected. If with benefics, there will be no danger to life. Everything should be judged in the same manner. If the 19th, 10th, 3rd, 1st, 23rd, 5th or 7th (all reckoned from the Janma Nakshatra) are afflicted by malefics during their transit, there will be danger to life. If the planet be benefic, failure in undertaking will be the only result. If the three Nakshatras, namely, the 1st, the 10th and the 19th happen to coincide with the Sun’s entry into a new sign, or with the transit of any other planets from one sign to another, or with an eclipse, planetary war, or a fall of meteors or any other unexpected occurrence, there will be likelihood of death of the native or he will face some similar disaster.